At Air Navigation Pro, we are all pilots and we know what our users need when they fly. We are constantly innovating to propose to our user the Best in class Aviation Application so they can enjoy their flight the best way possible and rely on a solid application that will provide them with useful and efficient tools. You have now a ruler to measure the distance between two random locations on the map and the bearing between these points. This new tool is one of the most useful features in any flying application. Just tap on the map with two fingers for two seconds and the Ruler will appear. The ruler is "magnetic", it snaps to the nearest waypoint, and it snaps to your aircraft (but it won't follow your aircraft when it moves). Manipulate it as much as you want to calculate distances and true bearing. You will use this feature in case of emergency, route deviation and plenty of other in-flight situations. A position report indicating your position in ATC (Air Traffic Control) human language is now available. You will notice that there is a new item in the docks that you can find on the right side of the screen. “PR” is an addition. Tapping it will display Aircraft Identification, Flight Type and route, Position and Routing. The purpose of this dock is to help you when contacting ATC on the initial call. It will display your current position and intentions in a manner that will quickly let you transmit it over the radio, making it more easy for you. Air Navigation Pro make your flight safer and more enjoyable. We have setup a range of alerts for various purposes so you can actually enjoy your flight and let the App alert you of what is important upon your own settings. 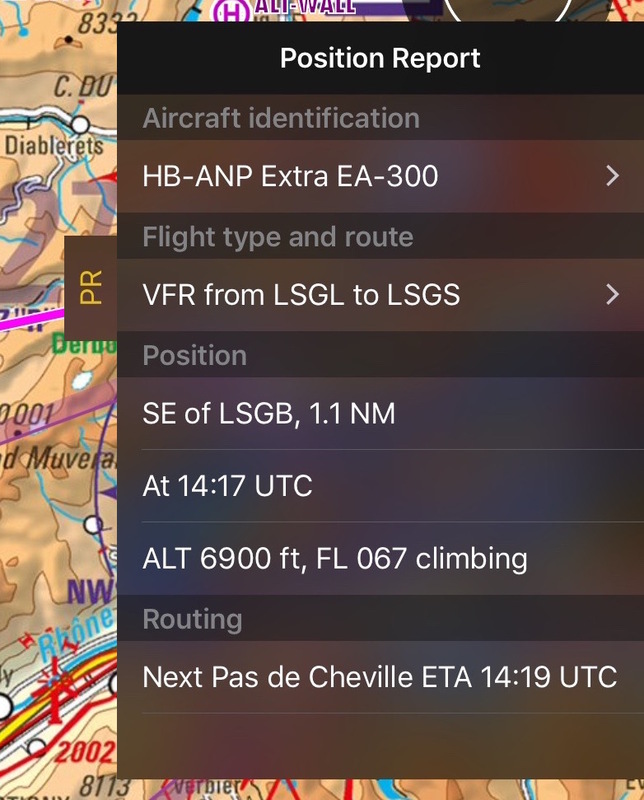 Under flight parameters, you may tap on alerts to access a list of options available. Cruise Altitude Alert This alert will notify you when reaching the target altitude and get alerted when leaving it. this alert is particularly useful when you climb toward a target altitude for example. 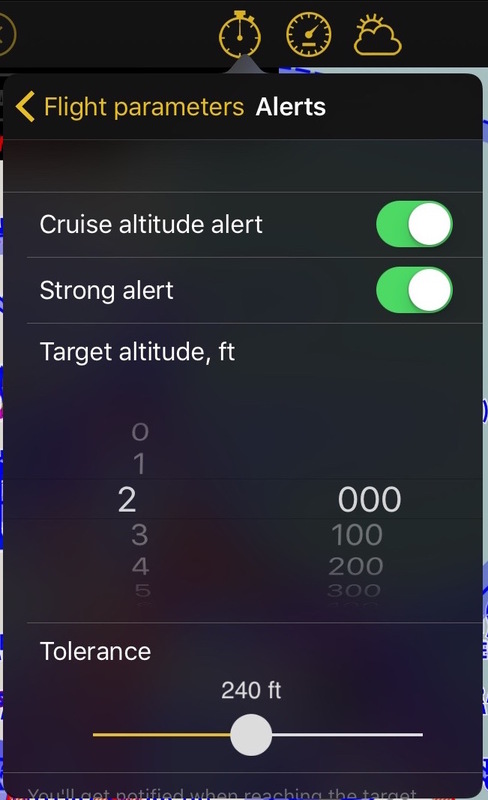 You fly at 3000 ft and you want to get notify when you reach your target cruise altitude of 5000 ft. You can now setup this alert in Air Navigation Pro. 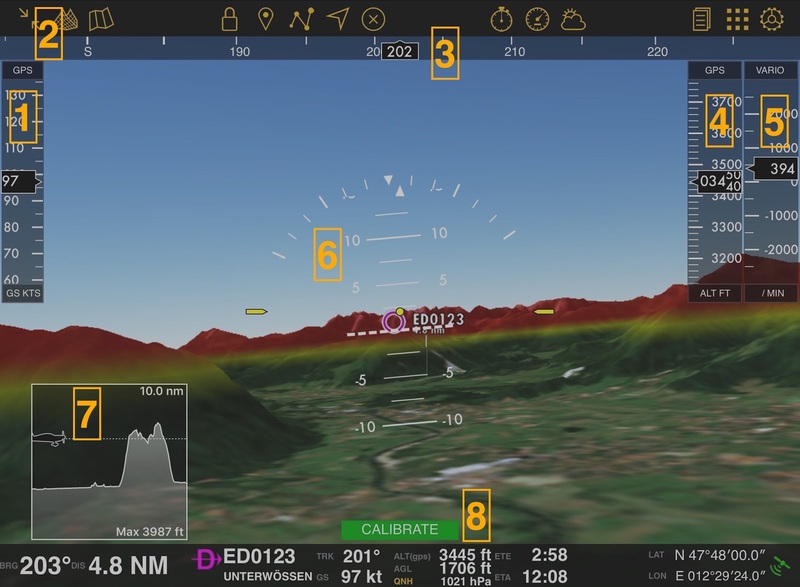 Configure your alert altitude at 5000 ft and get alerted when you reach this altitude. Continue your cruise and receive another alert when you leave the 5000 ft. Ground Proximity Alert With this alert, you will get notified when flying below 500 ft unless you’re near an aerodrome. Strong alert when enabled will catch your attention as the screen of the device will blink to notify about the alert notification. Of course everything is customizable upon your own need. Airspaces Ahead alert Get notified when an airspace is 5 minutes ahead of your current course, so you are safe of any surprise on entering an airspace and have enough time to take the right decision. This too, has a solid alert option as you can either choose to be alerted for a specific class type of airspace or only for the airspaces displayed on the map according to your selection in the map menu. This alert is particularly useful when you want to avoid certain types of airspaces. Select the list of airspace types that you want to avoid, and get notified all along your cruise if you are about to enter those said airspaces. This will help you to better manage and adjust your route depending on your criterias. 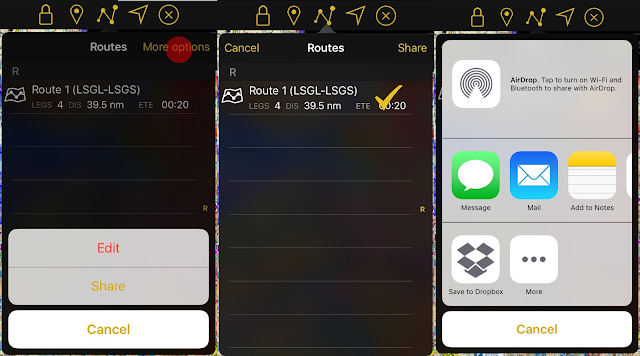 You can now share your saved routes via the library: convenient to share multiple routes at the same time. By tapping on "More options" - "Share" you can easily share one or more routes. After selecting the routes, tap on "Share" again and select the way you would like to do it. 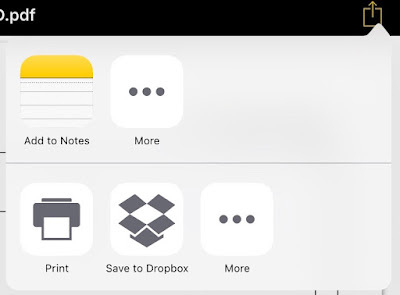 AirDrop allow you to share your route even if you don't have internet connection. Making it super easy for you to share anytime you want. You won't forget, no need to wait for a connection. Third party apps like Dropbox. Easily share your waypoints with others using the "Share" function. Tap on "More Options" - "Share", choose the waypoint(s) you would like to share and tap on "Share". You will be given the option to choose between different formats. Air Navigation Pro format: This format includes all the information related to the waypoint, like frequency and runways informations. Only compatible with Air Navigation Pro. GPX: compatible with third party softwares that supports this type of files. You can now print (PDF) or save the Approach Charts on the device. Please be aware that German Approach Charts are excluded due to copyright purposes. Based on user experience feedbacks, we have replaced the ADF by the RMI (Radio Magnetic indicator) instrument. this provide an additional bearing indicator. The RMI instrument in Air Navigation uses GPS information and does not receive any radio waves. The top part is the ADF indicator. The yellow needle is pointing towards the selected waypoint that corresponds to the longitudinal axis of the aircraft. 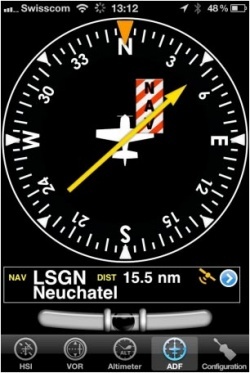 The compass outer ring can be manually rotated using touch and swipe up or down gesture at the left or at the right of the indicator. Below the main indicator the name of the active waypoint is displayed as well as the distance to the waypoint. It is possible to select any kind of waypoint (Airports, VOR, NDB, etc) as an ADF target waypoint unlike with a real ADF which requires NDB or AM transmitters as waypoints. You can select a new waypoint from the database with the "i" disclosure button on the bottom part of the instrument. Around the Store, we made things simplier. From now on, you can submit and purchase ATC flight plan only when you need them. No advance payment needed. You spend only what you really need. Out of screen symbol: When your aircraft is out of the screen, a symbol will be shown on the edge of the moving map in the direction where the aircraft is. You can tap on the symbol to center the aircraft on the screen again. This way you can keep your eyes off the screen and still never lose track of where you are on the App. Hi, great news on the update, but you haven´t fix the problem on the flight recorder, it is still spliting flights every time you land or every time the app is activated. Fix this, also the IFR plates and charts for Ecuador were promissed months ago and they are not available yet. I would like to know if this update has any BUG using an External GPS???? Hello claudia perezarcos, your external GPS must be compatible with iOS. Either you connect your external GPS by plugging it to the Air Navigation Pro Device, or by remote connection (wifi), Air Navigation Pro will deal with your external GPS. Votre application est en constante évolution, bravo! Je l'utilise sur Helicopter léger, en solo et là problème, trop de manipulations exigeant de lâcher les commandes (main gauche seulement). Ce type d'utilisation, sans doute marginale, est très spécifique : posé en campagne, vol rasant, pilotage constant, exige une ergonomie plus simple et intuitive. Sur ce plan, il reste beaucoup à faire, merci d'y réfléchir. Un mode "Simulation", serait bien commode, pour la préparation des vols, en 'intérieur et sans signal GPS. La fonction "Direct to" n'est plus active sans GPS (?). Beaucoup de critiques, mais Air Nav Pro, reste une excellente appli. Un mode "Simulation", serait bien commode, pour la préparation des vols, en intérieur et sans signal GPS. La fonction "Direct to" n'est plus active sans GPS (?). If you want to try something new to the list of your apps, you should take a look here - our blog where we post the latest news and hottest tips on tracking thematic.